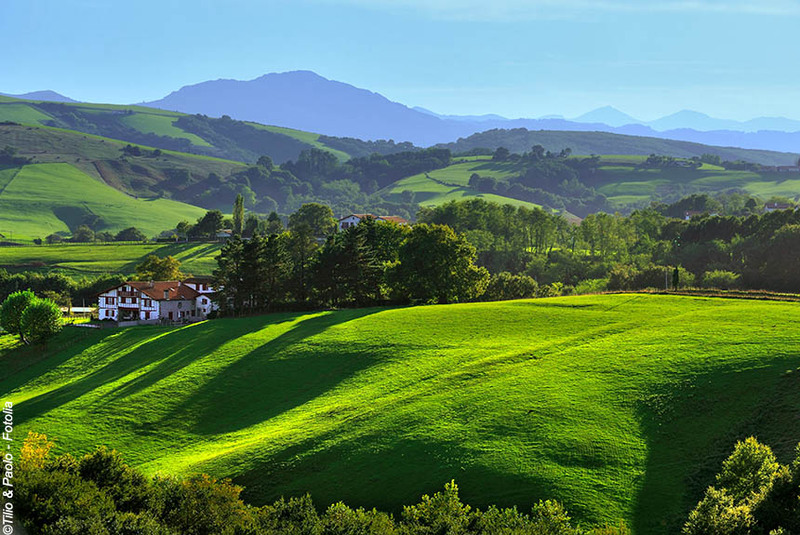 Walking on ancient footpaths and drovers' tracks through the foothills of the Atlantic Pyrenees is the most pleasurable way to explore the green and gentle landscapes of the Basque Country. Discover traditional red-and-white villages, and the Basque talent for great food and hospitality. This mountains-to-the-sea itinerary is designed for independent walkers wanting to enjoy the best of the Pays Basque in a week. It includes sections of the GR10 and is exclusive to Purely Pyrenees. 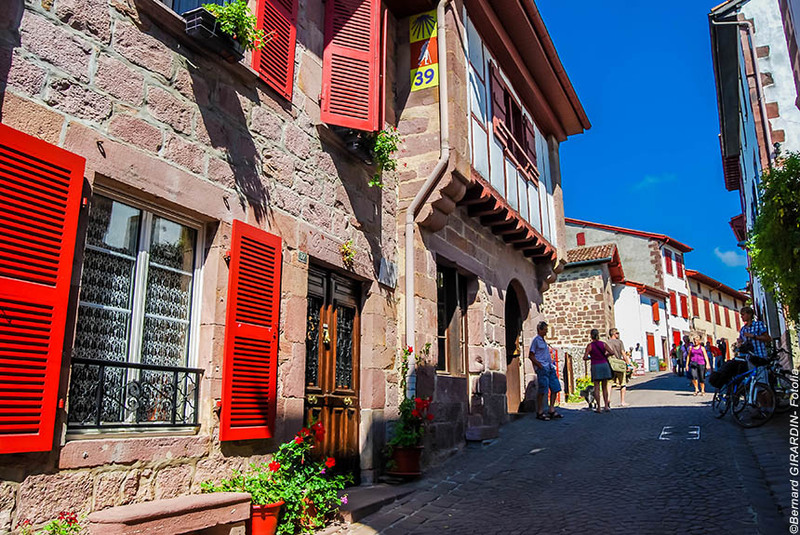 You start at the ancient pilgrimage town of St Jean Pied de Port and head through unspoilt hills and verdant valleys, discovering traditional red-and-white painted villages en route. One highlight is taking the rack railway to the top of La Rhune, the highest mountain in the western Pyrenees, and another is the satisfaction of arriving at the Atlantic at the vibrant and characterful fishing town of St Jean de Luz, renowned for its fish restaurants. The walking is pleasurably rewarding rather than challenging, usually 4 to 5 hours walking a day, and there are optional routes on most days. The accommodation includes characterful, high quality auberges as well as owner-managed boutique hotels where luxury is the norm. What is certain is that you will enjoy discovering authentic regional dishes, often with contemporary twists. Temperatures, even in high summer, are comfortable for walking, while spring and autumn are mellowed by the benign influence of the nearby Atlantic. Rainfall is higher than on the Med coast. This is an independent walking holiday, so we offer all the support you might need whilst leaving you to enjoy the experience in your own way and at your own speed. Standard option: You make your own way to the first night's hotel at Saint-Jean-Pied-de-Port (located just 500m from the train station). With extra airport pick-up: We pick you up from either Biarritz airport or the railway station at Saint-Jean-de-Luz. Pick-ups from Pau or Bordeaux can also be arranged (please consult us for prices). You stay in a hotel close to the walls of this ancient and attractive pilgrimage town in the shadows of the Pyrenees, which is on one of the Camino routes to Santiago de Compostela. A great start to your exploration of the Basque Country. We are sure you will get off to a good start staying at the impressive Hotel les Pyrénées almost in the shadow of the ramparts of the citadel. You stay on a dinner, bed and breakfast basis, and dinner in its Michelin starred restaurant will undoubtedly be a highlight. We take you up to the Col d'Ispeguy, the realm of Griffon Vultures, which provides you with magnificent Pyrenean panoramas (the first of many!). You can then choose from a variety of routes (generally unchallenging) down through hills and valleys to Bidarray. 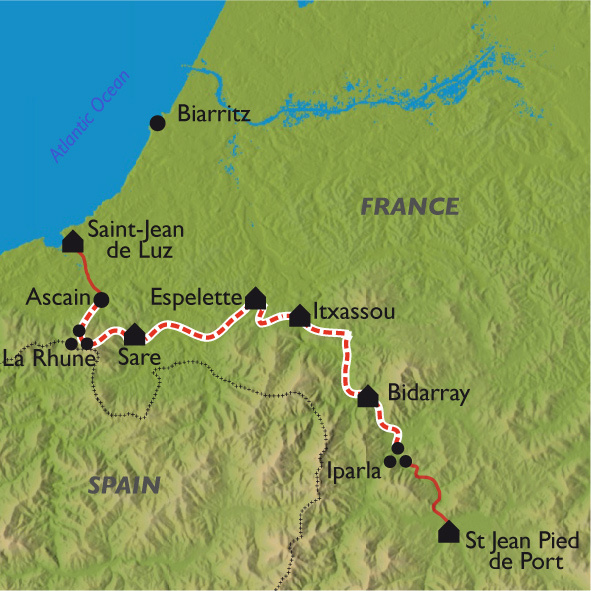 Alternatively, there is an easy walking route between Saint-Martin-de-Arrosa and Bidarray. A memorable first day's walking we promise you. You stay on a dinner, double room and breakfast basis at the attractive, authentic, family run Hotel Barberaenea in Bidarray, renowned for its Basque cuisine. A proven customer favourite. However, if you would prefer to stay at the wonderfully located Hotel Ostape with its own estate, heated swimming pool, sauna and Michelin starred restaurant, all offering panoramic views, then do contact us. Walking time : 4h or 6h30. Distance : 13km or 16,5km. Elevation : + 400 or + 800m / - 600m or -1300m. Transfer time : 35 minutes. This is a superb day's walking through Alpine type pastures (once as much used by smugglers as shepherds) visiting the lovely summit of Artzamendi before descending alongside streams to the marvellous walk-through the ring of rock that is the famous Pas de Roland and then onto the attractive village of Itxassou. You stay at the charming Hotel de Chêne (Hotel Oak) renowned for its regional authenticity, and the excellence of its cuisine. Dinner, bed and breakfast included. Walking time : 5h or 6h30. Distance : 12,5km or 16km. Elevation : + 590m or + 880m / - 650m or -890m. Today you can gently climb to the top of Mount Mondarrain - only 2,457 feet, but with absolutely stunning views over wave after wave of Pyrenean heights. Truly memorable. Then you stroll through high pastures and valleys down to the archetypal Basque village of Espelette that has been conserved superbly, has an interesting chateau and church, and an exceptional artisan chocolate producer (Antton), but is really famous for its festival of red peppers. Hotel Chilhar is a real treat in the heart of Espelette. Outside it is traditional Basque. Inside it offers boutique style accommodation, and wonderfully contemporary takes on traditional Basque cuisine. We are sure you will really enjoy staying here. Dinner, bed and breakfast. Walking time : 4h45. Distance : 16km. Elevation : + 620m / - 760m. This is a day of wonderful foothills walking through villages and hamlets, and along country lanes and farm tracks - the remarkable Ainhoa being the highlight. Easy walking through beautiful rural countryside, but interspersed with interesting places to see and things to do, not least from tempting artisan producers of foods, drinks, arts and crafts. You stay in Sare, which has 253 houses dating back to the 15th century, and rests almost in the shadow of La Rhune (which you will climb tomorrow). The Hotel Arraya is a superb 4 star hotel in a privileged location in the village that combines a historic building with boutique luxury and exceptional "cuisine terroir". Walking time : 6h30 or 5h30. Distance : 19km. Elevation : + 620m / - 760m. Your final panoramic highlight - and what a finale! 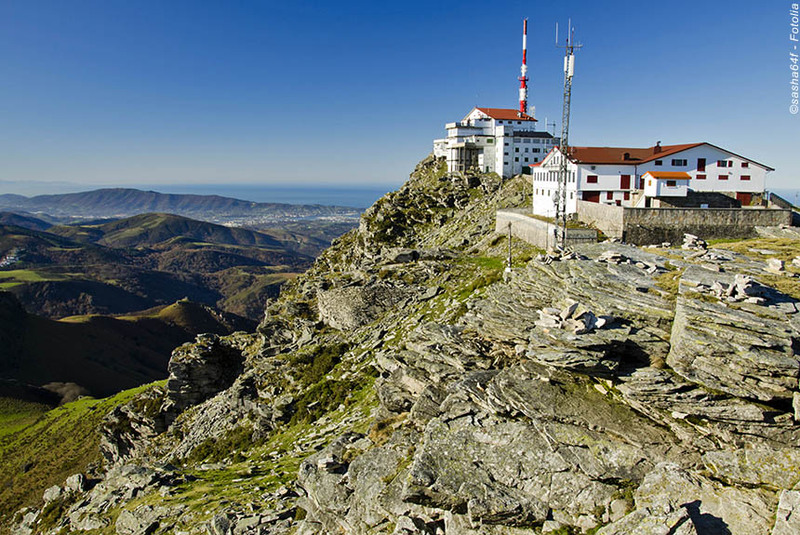 - is at the summit of La Rhune with its 360 degree views east towards the endless Pyrenees you have crossed, south into Spain, and west to the Atlantic coast. You can walk up - a steady walk that's perfectly "do-able" - or take the magnificent rack railway, its wooden carriages slowly clattering their way to the top. 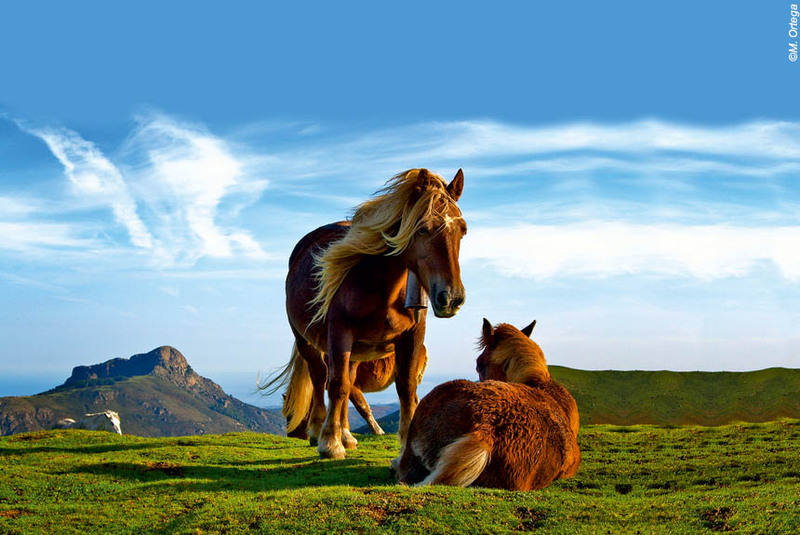 Look out for pottoks - wild mountain ponies - and red headed sheep. Certainly you can enjoy the walk down until you arrive at the pretty village of Ascain - your last Basque village, sadly. We will take you the short distance to St Jean de Luz by road, or you can kayak down the gentle Nivelle river to arrive in St Jean in independent style. As ever with Purely Pyrenees, the choice is yours. 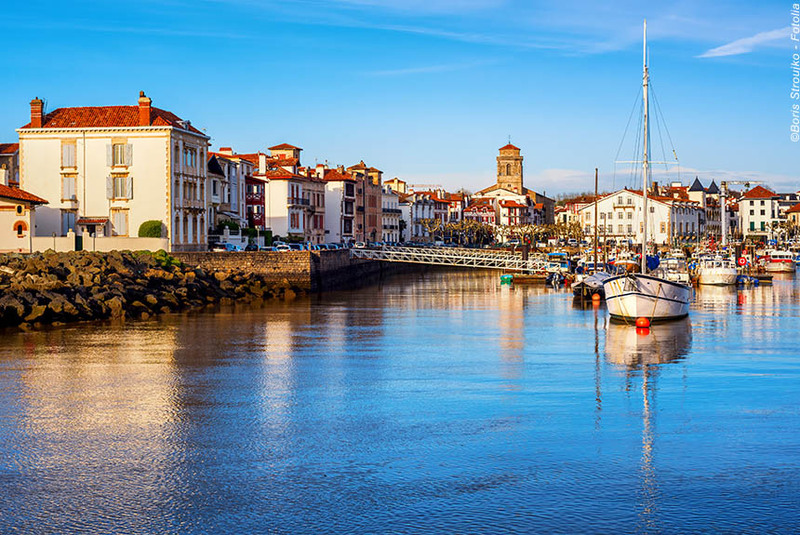 St Jean de Luz is one of our favourite - and liveliest - towns in the Pyrenees bursting with energy from its harbourside through its twisting streets to the bars and restaurants, many offering tapas as well as excellent fish dishes. You stay in the middle of the town at the impressive and comfortable Hotel les Almadies on a bed and breakfast basis, so you can choose your own restaurant for the final night, although we offer several recommendations. Walking time : 3h30 ou 6h. Distance : 10,5km or 15km. Elevation : + 500m or - 880m / - 500m or - 840m. Transfer time : 20 minutes. Standard option: Your holiday ends after breakfast. Your hotel is located just 500m from the train station at Saint-Jean-de-Luz. With extra airport pick-up: We will arrange a transfer back to Biarritz airport or a taxi to the train station in Saint-Jean-de-Luz. Transfers also available to Pau or Bordeaux (please consult us for prices). You make your own way to the first night's hotel at Saint-Jean-Pied-de-Port (located just 500m from the train station), or we can pick you up from Biarritz airport. Your holiday ends after breakfast, and your hotel is located just 500m from the train station at Saint-Jean-de-Luz, or we can arrange a transfer back to Biarritz airport. This itinerary features comfortable rather than challenging walking, and is suitable for most people who enjoy a good walk. You are mainly in the foothills of the Pyrenees rather than in the high mountains, and on most days there are itinerary choices, so you can choose easier or more challenging routes.Typically, there is 4 to 5 hours steady walking with ascents and descents of typically 200 to 700 metres. More challenging options are for 6 to 7 hours walking with ascents and descents of up to 900 metres. If the weather is really bad, or you are really tired, then we can usually transfer you to the next hotel by car. We will transfer your luggage to the next hotel, so all you need carry is a daysack with your choice of essentials plus picnic. You stay in authentic, high quality, family run hotels and auberges. Included is a standard double or twin room with en suite facilities, but we try to ensure our customers have the best of those rooms, often with balconies and/or good views. You can upgrade in advance through us, or at the hotel by paying on departure, but most people find this unnecessary. Usually someone at the hotel will speak "good enough" English, but you are in France! You will eat well, and find a surprising range of dishes and recipes, most regional and traditional with an often distinctive contemporary twist. You dine in two Michelin starred restaurants, but may well find other restaurants are just as good, and perhaps more enjoyable. Included is a 3 course set menu with several choices for each course, but you can pay supplements for upgraded menus or a la carte, although most people find this unnecessary. Wine and other drinks are not included in our price, so you pay locally. Usually transfers are in people carriers, mini-buses, cars or taxis. When we have received the balance of payment for your holiday, and in the month before your departure, we send you all the documentation you need: a detailed itinerary showing dates, times, contact addresses etc; a detailed guide to your walking routes, often also including a lot of cultural, historical and nature background information; formal documents (invoices, contractual terms and conditions etc); luggage labels etc. If you book at the last minute, we can send information to the first night's accommodation. 5 nights dinner, lunch, bed and breakfast; 1 night in bed and breakfast; people transfers as detailed; luggage transfers each walking day as required; detailed walking directions; 1:25,000 IGN maps as required; 24/7 customer phone service. The journey to the start point and from the finishing point; transfers offered at extra cost; dinners on the nights specified; lunches except when picnics are supplied; menu choices at extra cost; all drinks; entry fees; personal and travel insurance. All our walking holidays "Coastal Journeys"